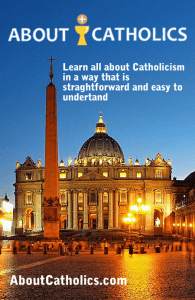 Read all the information you like from About Catholics in Ebook format. All information edited and ordered by topic, including the Basics of Catholicism, Marriage, Purgatory, Sins and much more, distributed in 18 chapters with a total of 240 pages, below you can see the Table of Contents. Includes new articles never published in our blog or anywhere else, including topics about Catholics going to Heaven, Children from Annulled Marriages, Praying to Saints and much more. If you love our website you will love even more our ebook. The book is in Kindle format so that you can read it on your laptop, mobile, tablet, kindle or any other device capable of reading kindle format. Please support us by letting everyone you know about our new ebook. Available for instant download after payment.